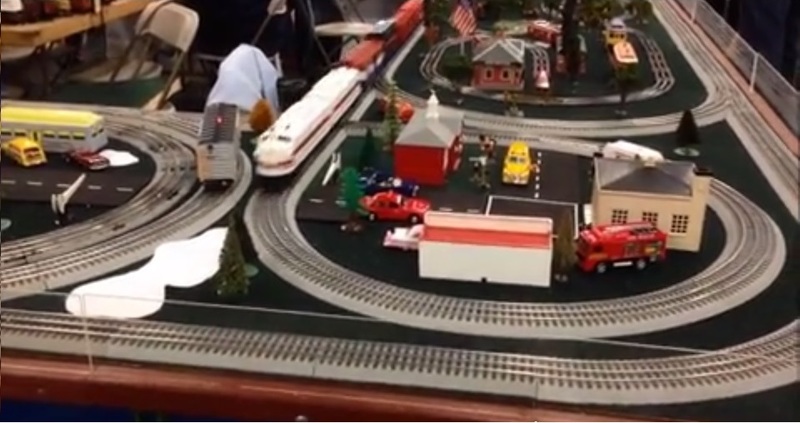 The All Aboard Fastrackers are a very active group of toy train enthusiasts in Southern California. They take their trains to shows and run them for the pleasure of the visitors. They have worked out a design for a set of modules that make the transportation, setup and operation easy and flexible. This page provides some information about that design, access to a couple of videos and some links to further information. This corner is made from 4 modules. The outer path is a normal 90 degree curve. The inner path is a 270 degree turn with a crossing. This set of modules permits the assembled layout to make a 90 degree turn for both the inside and outside tracks. It also adds some excitement for the viewers when the train is just long enough to fit in the inner path. The track is Lionel Fastrack - hence the name of the group. A module uses 2 10-inch straight tracks or 2 O-36 curves for the outer path. Typical displays use pairs of modules - one for the inner path and one for the outer path. That permits room inside for O-27 turns or other types, scales and sizes of trains and tracks. In the videos, you will also see techniques for assembling layouts using a pair of curve modules at the end of a leg, a larger T-module for right angle connections and more about the clever corner arrangement shown above. These folks are active in Southern California. They have a design for 20-inch square modules that way only about 6 pounds. The system is very flexible. It allows for O-Gauge trains, of course, and for other gauges as well to be tucked into spaces on the squares. A video showing construction of a module. Here are the All Aboard Fastrackers setting up for a show with some details about how the modules go together. This video comes from a recent TTOS show in Anaheim, California. It shows a nice selection of modules with running trains starting at about the 5:15 time. The index view looks down one leg of the show setup. The leg is two modules (or 40 inches) wide. Optional switches replace curve sections to allow more modules to be added on or not as required. Here is a link to the PDF file that contains the construction details. That sheet does not have site navigation on it. Use your browser &apos;Back&apos; button to return.